Anonymous è nato come un'ideale, un'ideale che unisce le persone del mondo nella lotta per i diritti umani e la libertà. Abbiamo assistito a guerre fatte per l'oro nero, sottomettendo i popoli solo per convenienza, tramite accordi commerciali di miliardi di euro. Per non parlare del buco dell'ozono , che favorisce il cambiamento climatico rendendolo pessimo per la popolazione, estinguendo centinaia di specie animali. Oggi però non siamo qui per parlare solo di quanto sopracitato, ma anche di quanto sia necessario migliorare la qualità dell’aria nel mondo, e per questo dobbiamo compiere ulteriori sforzi, tra i quali la riduzione delle emissioni di ammoniaca, causate per il 95 % dall’agricoltura. Tutti sappiamo che la lotta contro l'inquinamento atmosferico è uno dei cardini delle politiche ambientali degli ultimi anni. Tuttavia l'unico settore, ovvero quello dell'agricoltura, responsabile del 95 % delle emissioni di ammoniaca dell’UE, non ha fatto registrare convincenti passi in avanti. Quindi non basta ridurre le emissioni industriali e degli autoveicoli, come chiedono le stesse lobby agricole, né abbattere o rendere piu' efficente l’uso dei fertilizzanti azotati, come chiedono gli altri settori. Il Popolo spera che le grandi lobby, non solo industriali, ma anche agricole e di allevamento intensivo, si rendano conto del grave danno che stanno causando ai polmoni del nostro Pianeta. Non vogliamo più oppressione, e sangue versato nelle strade in nome dell'avidità. Anonymous began as an idea, an idea that unites people of the world in the struggle for human rights and freedom. 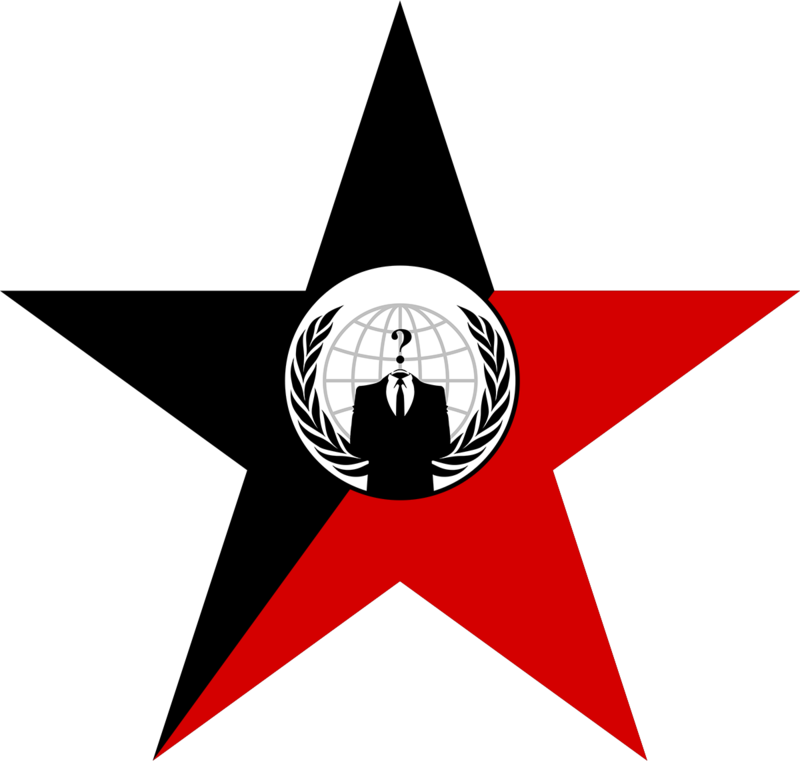 The same ideals that led to the birth of this faction of Anonymous. 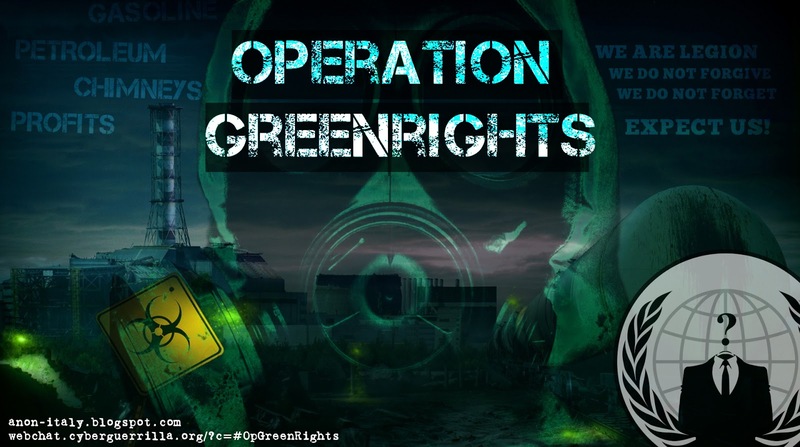 Operation Green Rights is the sum of our frustration at seeing the human race enslaved by god's money, which commits murder, exploit and oppress people and goes against the principles of democracy and human respect that should be the basis of any modern civilized society. We have seen wars carried out for (the black gold) oil, natural gases, precius metals or for access to vast pastures or arable land, subjecting people to convenient dictatorships for trade agreements, meanwhile billions are spent on weapons research and nuclear war, and funding for research on renewable energy keep getting cut, and oil tankers keep sinking. In addition, global warming, caused by these policies, it is a reality that we must be aware. The glaciers are melting, tides rise, the ozone hole is growing, the climate changes, changing climatic conditions, animal species become extinct. The current global policies of many large corporations and many governments are trampling on our rights and those of every other living being, only in exchange for money. We of Operation Green Rights say stop to this! Operation Green Rights wants for our children a life in a civilized world that welcomes them with open arms and show respect for life and nature itself. We want that Mother Earth will continue to live healthy and promoting life with its beauty. We want the exploitation of peoples and the blood spilled in the streets no longer in the name of greed. But today we are not here just to talk about that, but also about the air quality in the world (that we should do something more to change the disaster we making day by day) and how industrialized agriculture is responsible of 95% on Ammonia emission in air, water and soil. We all know fighting air pollution is the main point of many environmental "policies" and "schemes" of the past few years. However, agriculture, and specifically meat production, seems the only sector always omitted and forgotten. It's not enough to reduce factories and vehicles gas emissions, as asked by the agriculture lobbyists, neither is "a more efficient" use of heavy nitrogen fertilizers, as asked by the other sectors lobbyists. It becomes futile trying to reduce air pollution while continuing to pour tons of manure, drugs, chemicals fertilizers and all the others byproduct of intensive farming into rivers and landfills. The People hope the big Lobbies, not only the Industry, but also the Intensive Farming and Meat Producers, understand the damages they are doing to the heart, lungs and blood of our planet. Operation Green Rights wants a future for our kids where a clean and civilized world is waiting for them with open arms where there is respect for nature. We don't want anymore oppression and blood to rule because of greed. Fire & Gas Systems, Fire Fighting Systems, Analyzer Systems, Pressurized Cabinets and Air Conditioning Units. Direi che è arrivato il momento di ristabilire un equilibrio con tutto questo gioco d'azzardo, fino a che rimanevano nel loro territorio non avevamo possibilità di combatterlo,ma ora è giunto il momento di sradicare il problema dal web, sappiamo cosa fare.